For this week’s article, I’ve decided to hop on the Octoberween bandwagon and write about some spooky animated films. And what better way to celebrate this time of the year than to write about a couple of films with the “Tim Burton” label on them? The Nightmare Before Christmas (1993) has the lovely benefit of being watchable during two big holidays, thus making it marketing gold, and quite a popular film. Corpse Bride (2005) is the lesser known and less popular of the two, and only really good for the spookier of the two holidays that The Nightmare Before Christmas caters to. 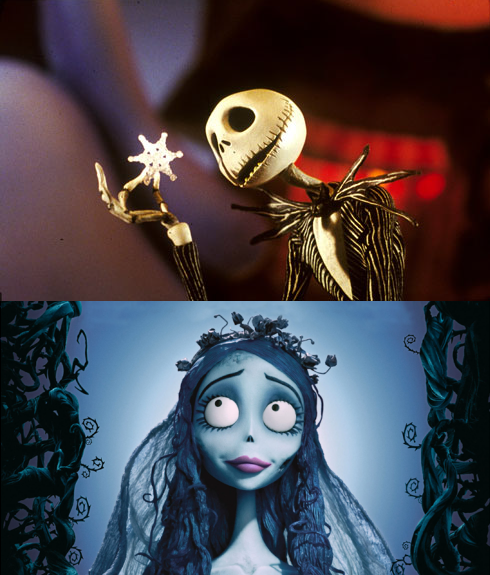 Furthermore, Corpse Bride is somewhat of a rip-off of the older of the two films. Despite this, I feel that it is a shame that it is often overlooked, because in my opinion, Corpse Bride is the better film. Story-wise, both movies are very different. 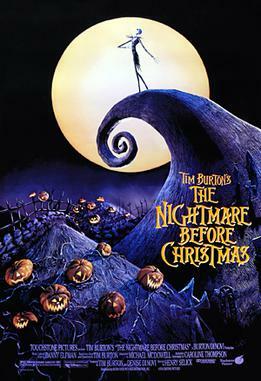 The Nightmare Before Christmas is about the Pumpkin King, Jack Skellington (Chris Sarandon), who is bored with “the same old thing” and decides to hijack the Christmas Holiday upon his discovery of it. Corpse Bride is about a man named Victor (Johnny Depp) who is about to enter an arranged marriage to a woman named Victoria (Emily Watson), but accidentally marries Emily (Helena Bonham Carter), the titular “corpse bride” who has long awaited for someone to marry her after being killed by her former fiance. Both are rather macabre and dark in tone and nature, but musical and wackily animated enough to allow parents to show them to their tiny tots. Looking at the similarities between the two films we can see that both are Tim Burton produced, both are stop-motion animated, both feature the dead, and both are musicals with Danny Elfman creating the scores. They both begin with a dark spooky atmosphere and nearly monochrome palettes, until both of their respective main characters discover a different more colorful world – both in atmosphere and actual color scheme. The ironic difference being that in The Nightmare Before Christmas it is Halloween Town that is the darker, greyer world while in Corpse Bride the Land of the Dead (this movie’s Halloween Town rip-off) is actually the more interesting and colorful one. Both movies have romance as part of their plot (though in the Corpse Bride it is a more central point of conflict), and the female romantic interests are actually pretty strong characters. Upon re-watching The Nightmare Before Christmas, I found myself liking Sally (Catherine O’Hara) the best of the main cast, with all the clever ways she escapes the scientist and how she realizes the threat of Jack’s schemes and tries to stop him. And Emily as the “corpse bride” has a fun and quirky attitude that symbolizes the breaking from the customs and tradition of the more pious world of the living. As a musical, The Nightmare Before Christmas without a doubt exceeds Corpse Bride. Putting the dialogue into song flows much more smoothly in Nightmare and the songs are all too easy to sing along to (don’t tell me you didn’t start singing “This is Halloween” along with the video at the beginning of this article). Corpse Bride‘s music seems almost tired and forced, and the songs are just plain unmemorable. However, I do truly enjoy the piano solo performed by Victor, which replays throughout the film in the background. It is beautiful and atmospheric and combines the mirth and melancholy that is prevalent in the story. This is where Corpse Bride exceeds – well written, likable characters and a much more moving story. Jack Skellington is a fun character who has his flaws and learns from them (sort of) by the end of the story. But the plight of those in Corpse Bride is much more compelling to me. I like the unique choice to have the couple in an arranged marriage to surprisingly fall in love, and still manage to create some conflict around that. And by the end of the film, you realize that Emily is a truly lovely person. Corpse Bride can still be easily seen as a rip-off of The Nightmare Before Christmas, and it is rather sad that it will probably remain in the shadow of such a popular classic. But I hope that upon reading this, you decide to give it a watch, since it most assuredly deserves more attention and praise.